Rome’s markets have the perfect gifts for foodies, trendsetters and more. 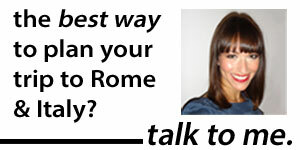 Discover where to find what at my new post on Rome for the New York Times’ In Transit section. Like everything else, Christmas in Rome may not be quite what you expect. You won't see a Santa Claus on every corner or hear Christmas carols in every shop, and the city's Christmas markets are lacking compared to those in northern Europe. But Christmas spirit is alive and well in Rome — you just have to know where to seek it out. 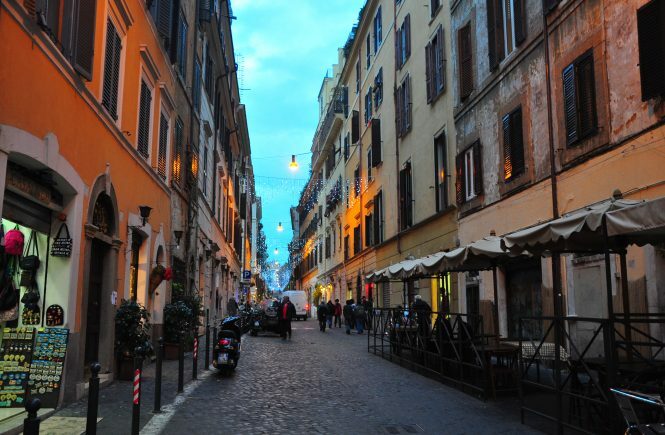 And so, I give you: Twelve ways to get into the Christmas spirit in Rome. (Try humming along while reading. Believe me, it helps). 1. On the first day of Christmas, Rome gave to me… one Santa house. Over the next month, Rome's Auditorium transforms into a holiday extravaganza, with 40 Christmas trees, visits with Santa, a Christmas market, and an ice-skating rink. 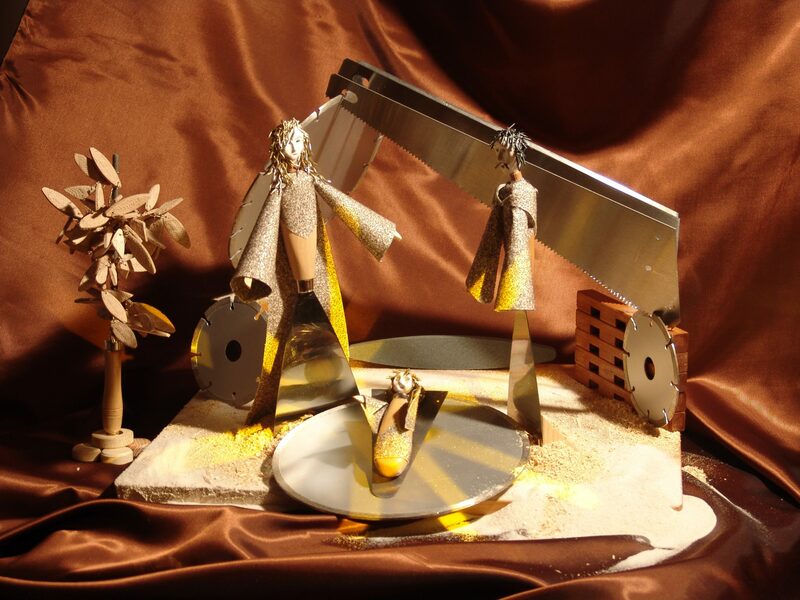 A full calendar of events includes a gospel festival from Dec. 19 to 26. 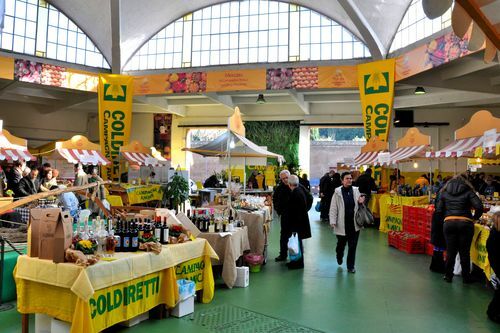 The Christmas festival runs until Jan. 9; the Auditorium , located near Stadio Flaminio, is easily accessible by bus (the 910, 217 and "M" both go there from Termini) or the number 2 tram from the Flaminio metro stop. For more information, click here. 2. Two ice skates. Slipping and sliding Skating underneath the iconic silhouette of Rome's Castel Sant'Angelo, the ancient-mausoleum-turned-castle-of-the-pope, is a holiday tradition. Click here for more information on the Castel Sant'Angelo rink. Other skating rinks in Rome include those at Re di Roma, Tor di Quinto, and Villa Gordiani. 3. Three…thousand Christmas cribs. Along with its dozens of other museums, Rome even has one devoted to presepi. Featuring more than 3,000 scenes from all over the world, the museum — which is closed in the summer — is open every afternoon from Dec. 24 to Jan. 6, as well as during other limited hours throughout the winter. 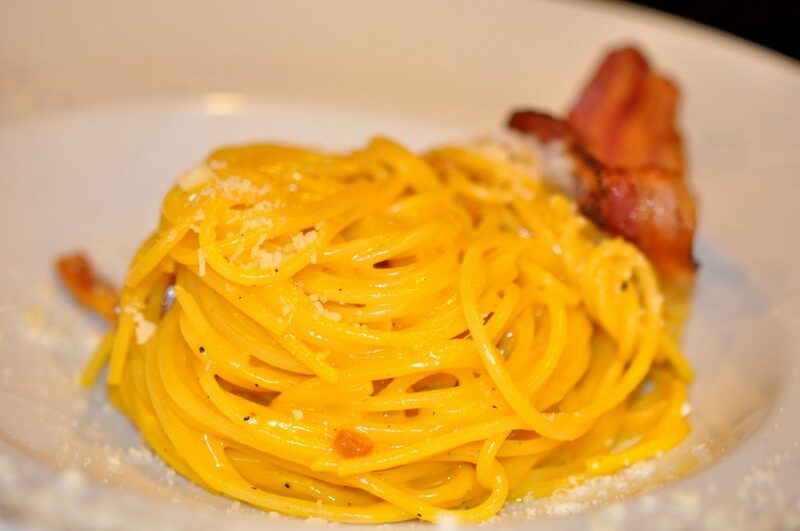 It's located under the church of Santi Quirico e Giulitta, nearby the Colosseum. For more information, call 06 679 6146. 4. Four (bites of) panettone. Rome's food traditions are incredibly seasonal — and if you want to taste some of the city's best cookies and cakes, Christmas is the right time to come. Try panettone, a traditional Christmas cake (although it tastes more like sweet bread) filled with candied fruits. Other sweets to taste include panforte (a much heavier, denser Christmas cake that's akin to fruitcake) and torrone (chocolate bars filled with nuts or nougat). 5. Five nights of Christmas music. The internationally-renowned academy of Santa Cecilia hosts holiday-themed concerts on five different nights in December, starting on Dec. 7. Make reservations in advance. 6. Six silks a-saving Sudan. It's a Christmas market with a twist: The goods include everything from Nepalese hats to Cambodian silks to Italian panettone, and the proceeds go raise money for the Pediatric Centre in Nyala, Sudan. The Emergency Christmas Market takes place this year at Palazzo Velli on Piazza Sant'Egidio 10, in Trastevere, until Dec. 23. 7. Seven chances to see the Pope a-flying by. Getting a rare ticket to Christmas Mass isn't your only option. 8. Eight (thousand) toys a-hanging. 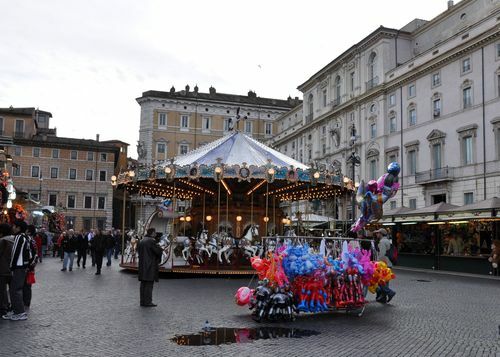 The goods at Rome's main Christmas market at Piazza Navona aren't anything to write home about — they're mostly mass-produced toys, decorations, and candies. Still, there's something about seeing Piazza Navona all done up for Christmas, and seeing so many Italian families out and about and in the holiday mood, that's worth making a stop. There's also a carousel for little ones. 9. Nine Lessons and Carols. To celebrate the 4th Sunday in Advent, St. Andrews' Presbyterian Church of Scotland is having its Service of Nine Lessons and Carols — followed by, the website says, "mince pies and mulled wine in the manse." Yum! (And, a "manse" sounds pretty cool). The Nine Lessons and Carols service, in English, is at 11 am on Sunday, Dec. 19. 10. Ten(-squared) cribs a-…cribbing. 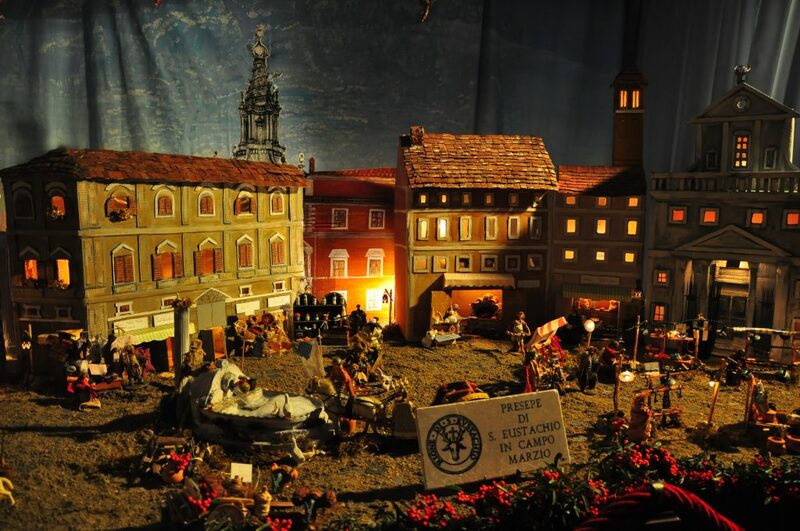 Now in its 35th year, Rome's "100 Presepi" exhibit of Christmas cribs — including both traditional cribs and the more creative, made out of every material from ostrich eggs to tea bags. The exhibit also has a crib-building workshop for children called "Nativity as a Game" (reservations required). The exhibit runs until Jan. 6 and is located at Piazza del Popolo's Sala del Bramanta. For more information, click here. 11. Eleven pipers piping. It's the time of year when sheepskin-clad bagpipers and flutists from Abruzzo and Calabria come to Rome, playing traditional Christmas songs in the streets. They're performing for free, so if the sheepskin didn't give it away, you'll be able to tell the difference between them and Rome's usual hordes of buskers! Look out for them around the Spanish Steps, Piazza Navona, and St. Peter's. 12. 12-and-unders singing. This (English) service will retell the Christmas story through activities and carols. It's at the All Saints Rome Church at 5pm on Dec. 24. 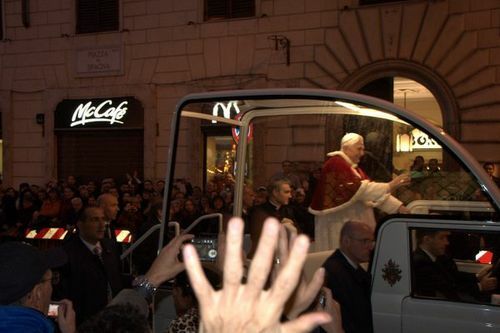 Over the Christmas holidays, many visitors to Rome have one goal in mind: how to see the Pope. (Note: This post has been updated to reflect 2018 dates and information!). The brass ring of the experience is, of course, midnight Mass at St. Peter’s. While that’s a very, very special (if crowded) experience, it’s also tougher to book than a scavi tour. If you want to take a shot, then fax or write the Prefecture of the Papal Household at +39 06 6988 5863 with your information; here’s where you can find out how to book midnight Mass at St. Peter’s. Keep in mind that this is best done at least a couple of months in advaance. By December, it’s pretty safe to say there won’t be any spots left—unless, that is, you’re in with a parish that can try to work their magic for you. 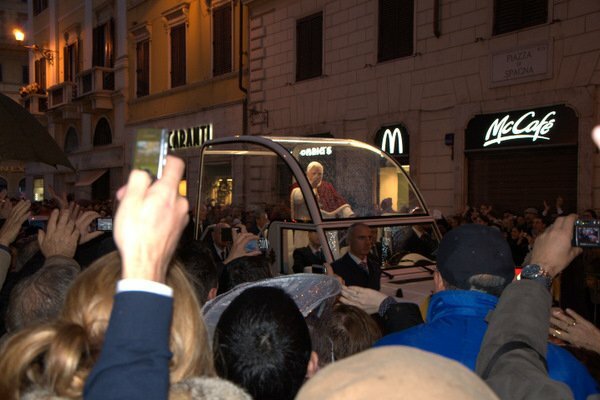 On December 8, see the Pope at the Spanish Steps. Each Feast Day of the Immaculate Conception, the Pope goes to Piazza di Spagna in an act of homage to Mary (see photo at top… previous pope, same idea!). 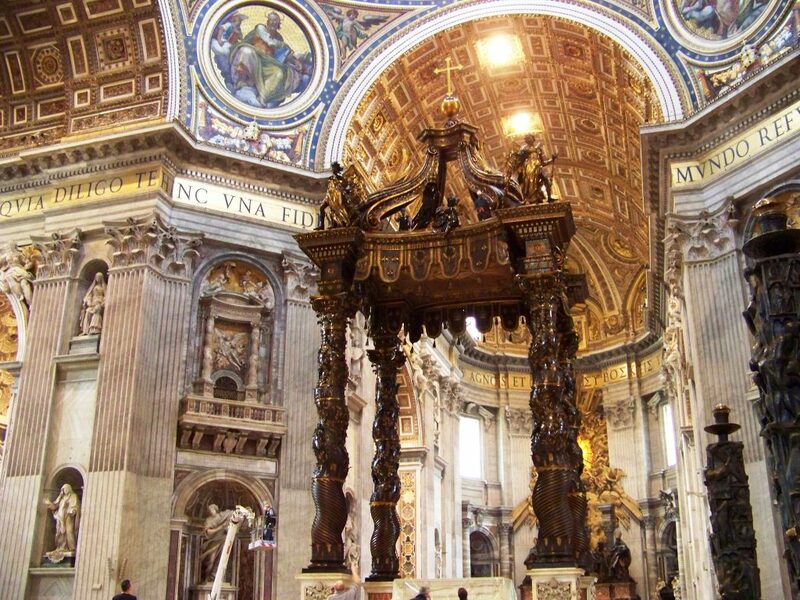 (Get there early to get closest to the column erected in honor of the Immaculate Conception, which is where the Pope will be for his blessing). It’s at 4pm, and no tickets are required. Even if you don’t have tickets to midnight Mass, you can still attend. You’ll just have to stand out in the piazza and watch the ceremony on Jumbotrons; not quite the same, okay, but still pretty neat with thousands of people packed into the square. Just remember that it’s actually at 9:30pm, not midnight. (Pope Benedict changed it a few years ago, apparently wanting to get to bed a bit earlier, and Pope Francis has followed in his stead). Go to “Urbi et Orbi” on Christmas Day. This is the special blessing the Pope gives the crowd — and gives all Catholics watching or listening through T.V. or radio worldwide — that happens only twice a year, at Christmas and Easter. The Pope appears at the loggia of St. Peter’s Basilica at St. Peter’s Square for the blessing at noon. Tickets aren’t required. Pray the “Angelus” with the Pope throughout December. For 2018, in December the Pope leads the faithful in prayer from his window at noon on Dec. 2, 9, 16, 23 and 31. For January dates, check here as we get closer. Tickets aren’t required. Attend a Wednesday papal audience. The general audience will occur every Wednesday in December and January, as usual. Tickets are required (but free); send your information to the same fax number as listed above for the midnight Mass. *January 2019 details have not yet been released; when they are, they’ll be here. However, they’ll be the same dates and likely the same times and locations as what’s shown above. Remember that, again, you need tickets for these Masses in advance. (For less popular ceremonies, you can turn up two or three days in advance and get them directly from the Swiss Guards, without having to fax in advance. Truly. But for special ceremonies like these, I’d recommend doing the advance booking).